The interiors of Le Coucou were conceived to break the conventions of the existing building and to contrast with the clean Scandinavian lines of the newly remodeled hotel. Roman and Williams have stripped away all of the years of renovations to expose the existing raw brick space. Onto these eloquent bones they have thoughtfully layered materiality, furniture and lighting that match the purity and integrity of Chef Rose’s cuisine. With Howard Street providing a prelude to the atmosphere of the restaurant, the goal is to cultivate the sense of ease that Roman and Williams as well as Chef Rose are known for, and to ensure people feel good in the space. This frank approach is clear from the exterior, where the visitor is greeted by custom wood planters filled with climbing vines of jasmine and rose framing the entry, and a bright neon Le Coucou sign featuring the playful outline of a bird. From the entry vestibule Roman and Williams have created a Dining Roomthat is a box-within-a-box, with sets of magnificent triple-hung glass windows that form a secondary façade within the space, an experience of permeable boundaries that unfolds layer-by-layer. 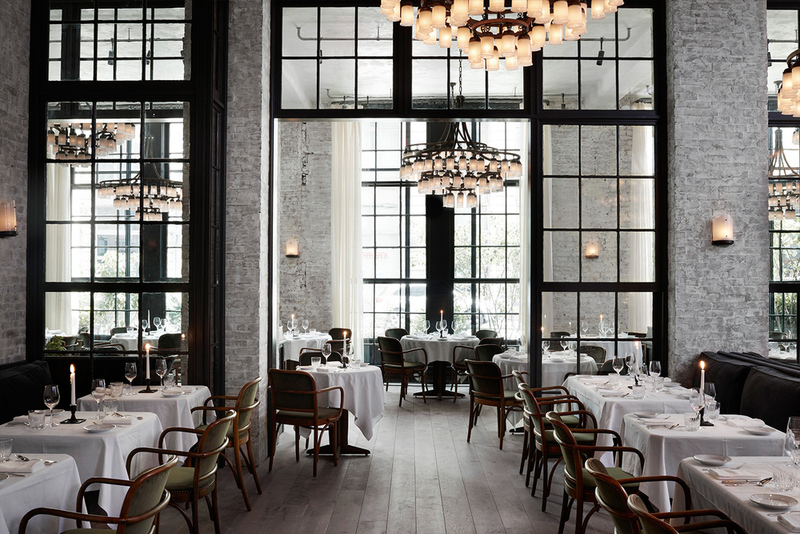 At the room’s crown, a grand procession of pewtered-steel chandeliers designed by Roman and Williams hang from the exposed concrete of the existing ceiling, lighting the room with a glow from hand-blown glass shades. Custom cast-glass sconces partner the chandeliers from their posts on the walls, where existing brick has been thickly whitewashed carefully to reveal layers of historical paint, providing additional layer and texture. 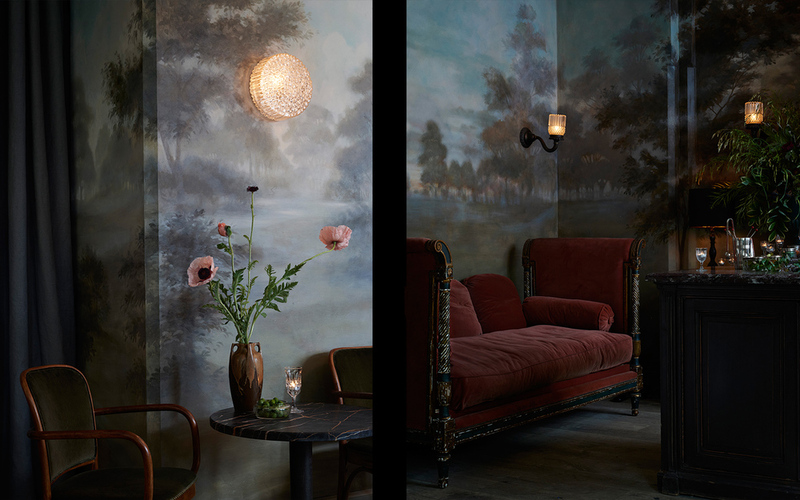 The borders of the room are further defined by a circuit of banquettes covered in hearty blue gray mohair, which pairs with Thonet armchairs circa 1925 that have been reinterpreted and covered in earthy olive green velvet upholstery. Stained white oak tables with linen tablecloths provide a canvas for the presentation of the meal.